And have you heard of Julia Carlota Herreras? 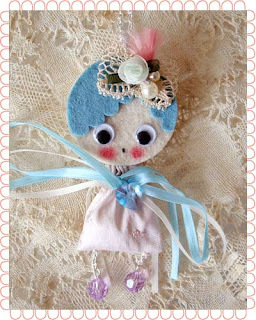 She´s a make-believe girl created by talented Anabel for her webshop Jugando con Hilos. 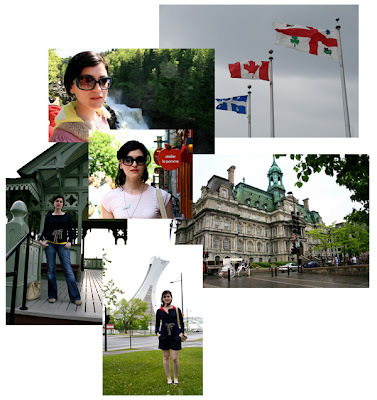 The girl is a self-confessed shop-addict and we get to follow her adventures at her blog, here. 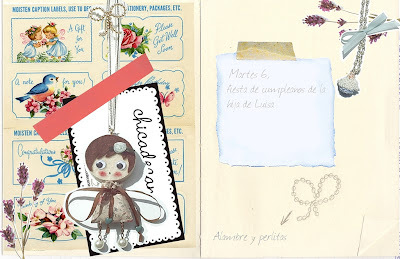 I love this collage that Julia Carlota Herreras made from her purchases at Jugandoconhilos.com.Sweet! This is the new necklace available at Jugando con Hilos! 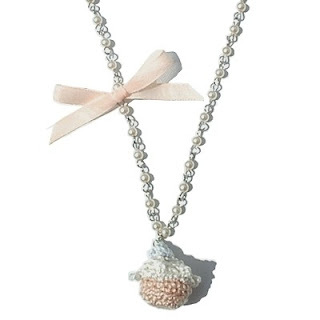 complete with pearl chain and ribbon. A steal at 14€! I asked Beatriz permission to show her in chicadecanela´s La Jolie Blouse because i thought she looked so charming in it! Somehow i started to see lots of pictures of her looking so sweet with chicadecanela´s pieces and i made this collage. Dedicado a Beatriz! THE blog dedicated to all things crafty in Spain. and Cécile Marie necklace. A detail of Le Ourson mobile phone charm. The lucky owner of this number please stand up and claim your prize! We will publish this on our web too. The winner has 1 week to claim her prize or we will keep drawing numbers!